Rather than disabling Flash completely in Chrome, an excellent option is to enable a hidden “Click to Play” feature that prevents that plugin and all others from automatically loading. 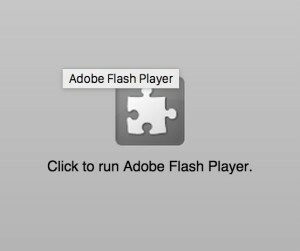 With Click To Play turned on, if you want Flash or another browse plug-in to run and load, you simply click on it to play or load the plugin. This feature is cross platform compatible, and it works the same in Mac OS X, Windows, and Linux, and it can actually speed up your web browsing experience a bit since it reduces load times on many web pages. Best of all, the Click to Play in Chrome option does not require any additional plugin downloads, it’s built right into new versions of the Chrome browser. Here is how to enable it in the newest versions and prior Chrome settings too. From here on out you’ll see the click to play image on any embed that uses a plugin. In some ways this is not as simple as just installing FlashBlock, but if you’re opposed to adding extensions and don’t want the kill-all approach of an ad blocker, this works just fine and it’s baked right into the browser. Oh and while you’re in about:flags menu, be sure to enable Tab Overview if you have a newer trackpad on your Mac, it’s basically Exposé for your Chrome tabs and windows and works wonders if you use tons of simultaneous browser sessions. naturally like your website but you have to take a look at the spelling on several of your posts. Several of them are rife with spelling issues and I find it very bothersome to inform the truth then again I’ll certainly come again again. It seems that latest Chrome browser shows ‘Click to play’ option by default.